Happy birthday Harvey Weiss (Maps: Getting from Here to There), Martin Waddell (The Pig in the Pond, Farmer Duck), David Adler (Cam Jansen mystery series), and Wendy Anderson Halperin (The Racketty-Packetty House). It’s the birth date of Eric Knight (1897-1943), Lassie series. In 1874, in Nebraska, the first Arbor Day was celebrated. Read Celebritrees by Margi Preus, Tell Me, Tree by Gail Gibbons and Our Tree Named Steve by Alan Zweibel, illustrated by David Catrow. Also, reread A Tree is Nice by Janice May Udry, illustrated by Marc Simont. April is National Poetry and later in the month we celebrate the Week of the Young Child (WOYC). More information and a handbook can be found at the National Association for Education of Young Children website. What are the books that introduce poetry to the young and that every young child should know? I am often asked this question in interviews, and over the next two days, I will look at some. 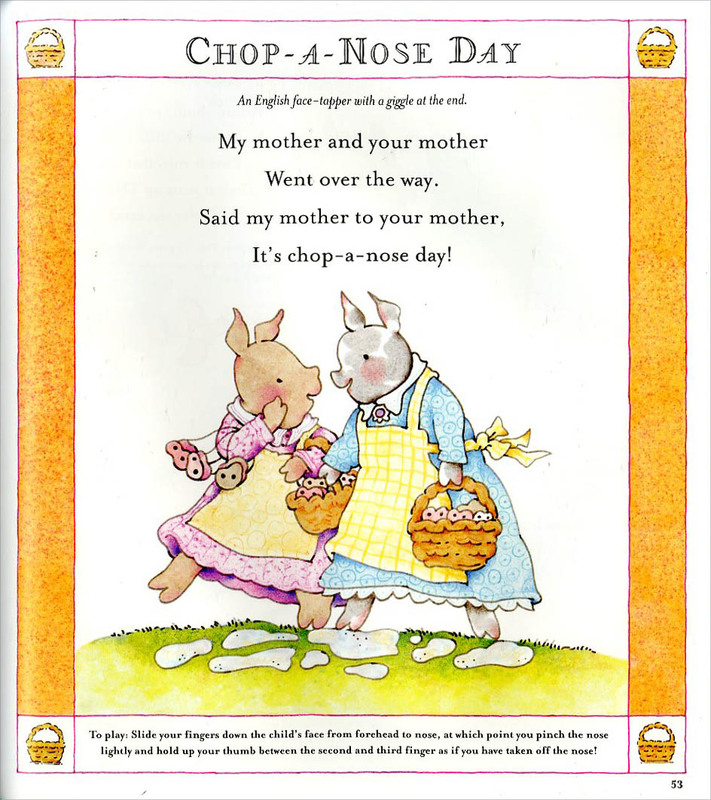 In the early years we want to expose children to poetry and rhythm (found in nursery rhyme volumes like This Little Piggy), information about the world around them (concept books), cumulative stories (We’re Going on a Bear Hunt), call-and-response books (Brown Bear, Brown Bear, What Do You See? ), and bedtime stories. One of the best baby shower gifts is an attractive nursery rhyme volume. These rhymes, which serve as lap songs or clapping games, are perfect for parents or infant caregivers. Many of these chants have been used with infants for hundreds of years, hence they form one of the cultural building blocks of the English language. 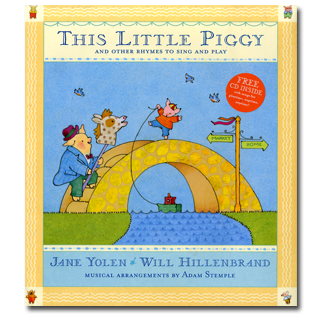 There are many superb collections, but since 2005 I have favored Jane Yolen’s This Little Piggy: Lap Songs, Finger Plays, Clapping Games and Pantomime Rhymes with Will Hillenbrand’s animated and whimsical drawings and Adam Stemple’s musical arrangements. To create the text for this lavish gift book, Jane Yolen, author of three hundred books, has deftly categorized more than sixty lap songs, finger plays, and clapping games. Each rhyme contains a note on how a parent might use it—a pragmatic and welcome touch. Then Will Hillenbrand’s vibrant animal characters act out the words. He has created dynamic pacing for the volume and made sure every page is pleasing to the eye. It is to his credit that a book with so many elements, including on occasion the history of a nursery rhyme, never seems overwhelming but appears clean, clear, and easy to use. The production of the book makes it even more special. A large format with sturdy paper and binding, readable typeface, and attractive cover (plus a CD of performances of the material) add to the pleasure that users of this book experience. Just reading This Little Piggy will make you long for an infant or toddler to pull on your lap. Tomorrow we’ll look at some concept books and a cumulative story. Today I hope those of you with infants and toddlers will spend some time introducing them to the pleasure of nursery rhymes. Originally posted April 10, 2011. Updated for . So happy to see this womderful book featured. It’s frightening to think there may be an entire generation growing up without these important “cultural building blocks,” a category into which fairy tales also fall. Recently, I was talking to a college student about Rapunzel. He looked at me quizzically. “What’s a rapunzel?” he asked. I felt like crying. I included this book in my teacher resource box for my music classes! This is a fantastic collection of rhymes and songs that really came in handy when I was working with preK-2 graders. The illustrations are beautiful, the text is easy to read, and the CD adds just the right touch! Well I grew up without this book, and I’m about to remedy that. However, when I hear that someone has authored three hundred books, I’m thunderstruck with admiration. ooh, just requested. We always tell parents, Mother Goose is a building block for learning English. And there’s actual scientific proof of it, though my notes are buried somewhere in the other room. But the more words a kid knows by the age of 3 can actually predict if he will go to college or something. I sound much more intelligent after 7:30 a.m. Just requested this book. And how is it, after 10 years of being a children’s librarian, focusing on preschool needs, that I have NEVER heard of the week of the young child? Thank you, Anita, for the work you do. And yes, Jane Yolen is a wonder. 300 books? Yep. Briar Rose is my favorite of hers.